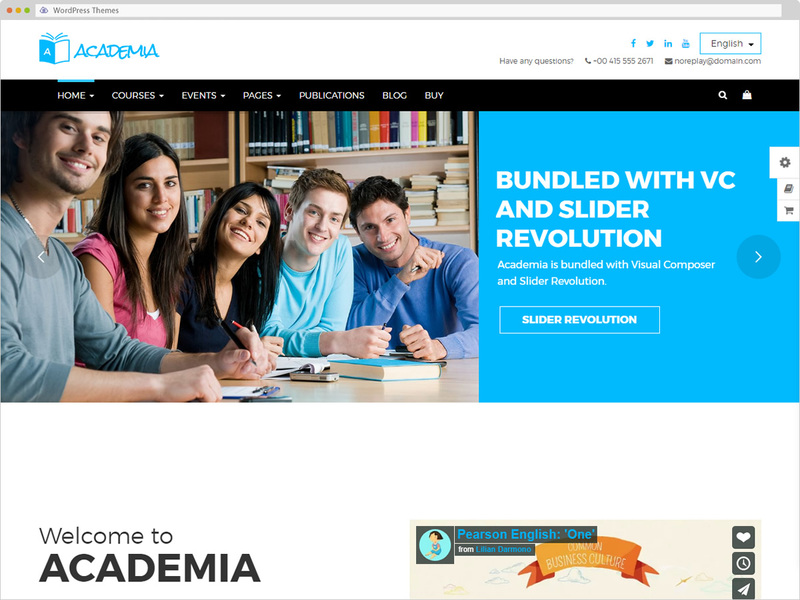 Education WordPress themes are designed for campus/university/school/college/courses and other education related websites to powered up. All themes listed below are hand-picked premium themes which comes with extensive documentations and tutorials. 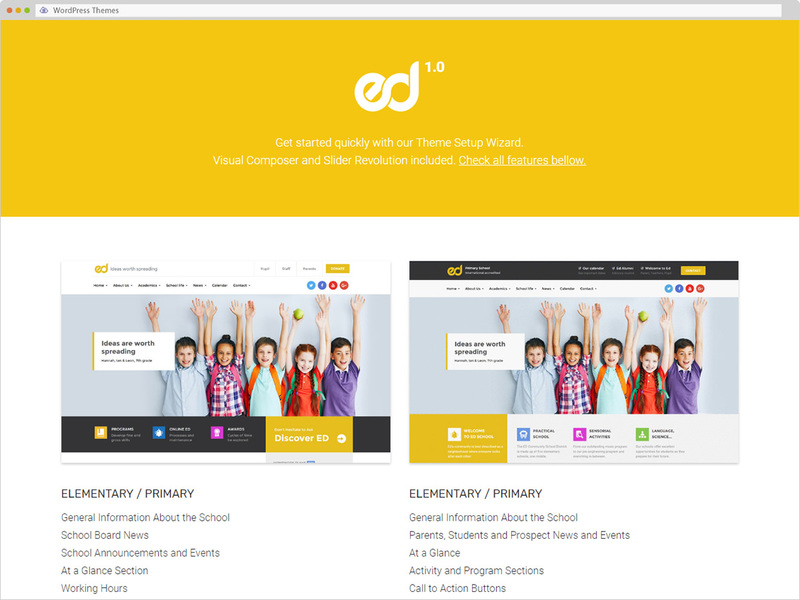 Designed for elementary school, high school, middle school university and college Using Ed School you can easily create a school website and easily edit the real content and compose the page layout with drag & drop page builder. 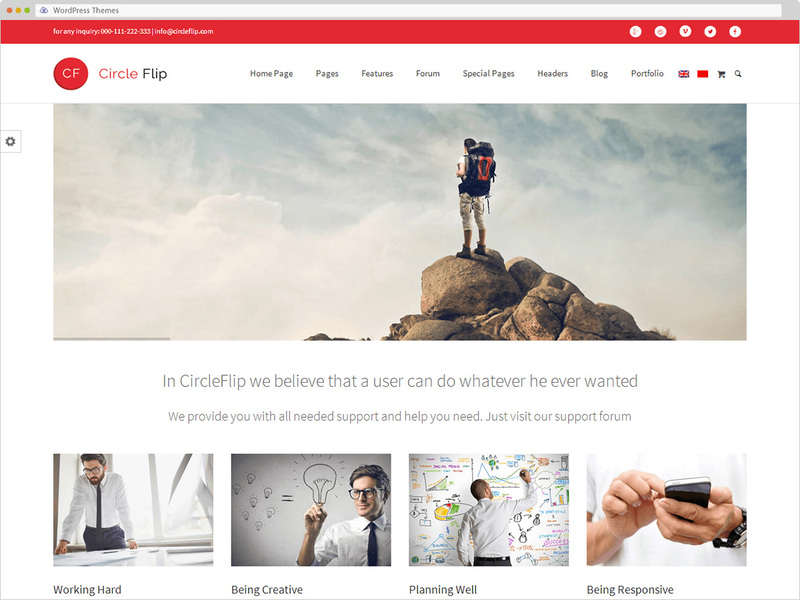 This theme comes packaged with Visual Composer and Revolution Slider premium plugins which give you another level of power when customizing the site to fit your needs. Unlimited colors and collection of Google Fonts give you even more scope to personalize the look and feel of your website. You can add profiles for your Teaching staff and tutors, with description, Photo, Contact details, Schedule and manage your school events. Also inculded Mega Submenu addon for Visual Composer. Simple and easy to use. Professional businesses use Kallyas as a one page website photography gallery corporate hotel leisure spa industrial construction architecture architect lawyer law travel booking modern school education university lms kids fitness gym sport directory event beauty lifestyle landing mobile marketplace app job product game best admin jewelry food restaurant clean web design yoga ux ui wedding watch hair salon barber technology electronics transport transportation logistics retina RTL Parallax Revolution slider. Community support. Newspaper Membership Coming soon charity summit motivational speaker keynote coaching coach mentor trainer therapist training theater. 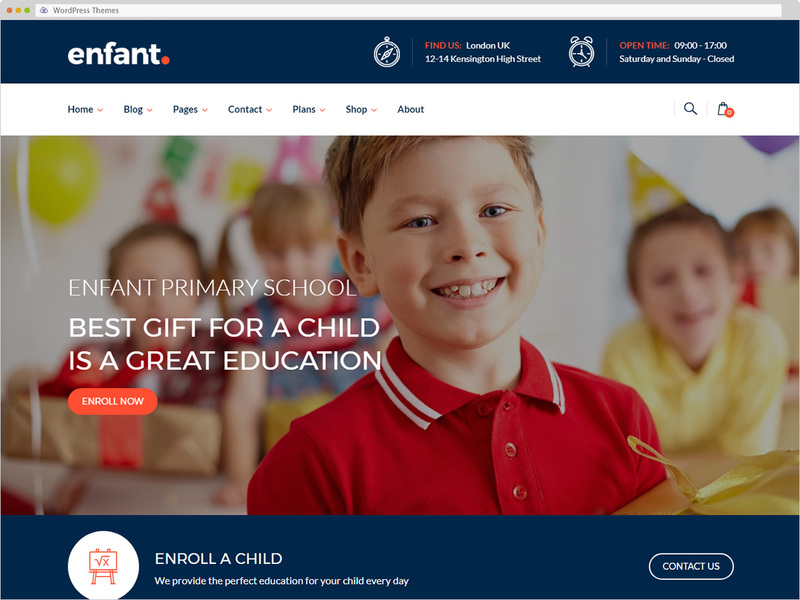 Enfant is a premium educational WordPress theme, designed to offer you the best online experience ever, with a super friendly approach and complete features for great performance. 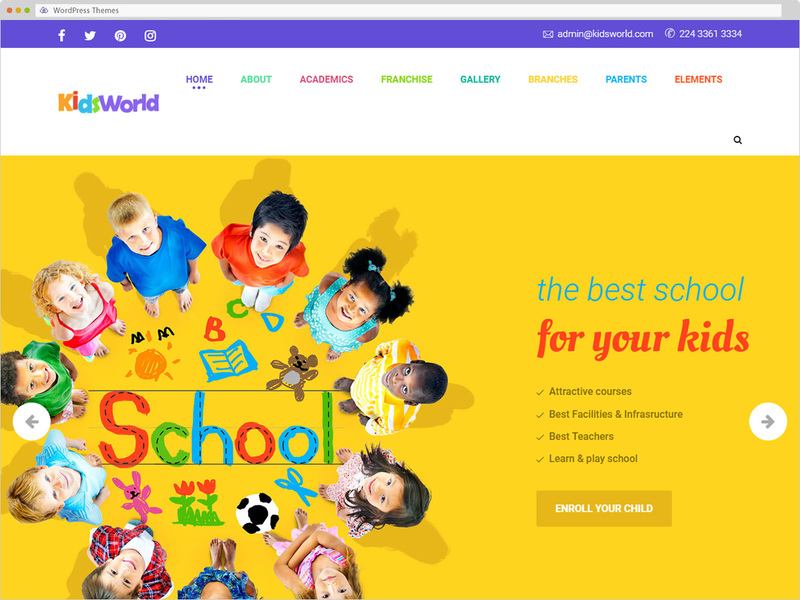 Based on our experience with our previous theme Kiddie – Enfant is the next generation and one of the best education WordPress themes around, containing all the features you need to create a stunning website for any education related business and set it up in a few easy steps. You can sell both online courses either onsite courses. 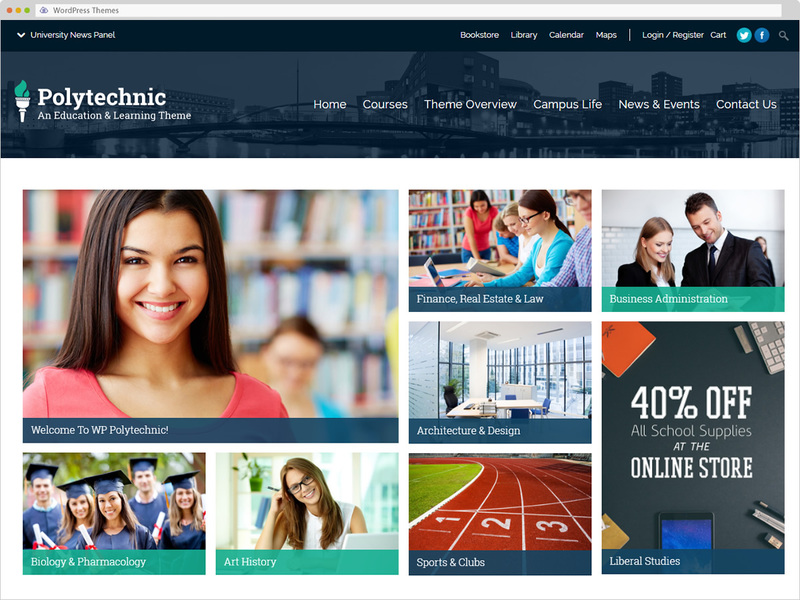 It provides awesome features for creating online courses, online shop, teacher profile, user profiles, lesson management, quiz system, questions system, events, tracking course progress, analytics, call to action banners etc. 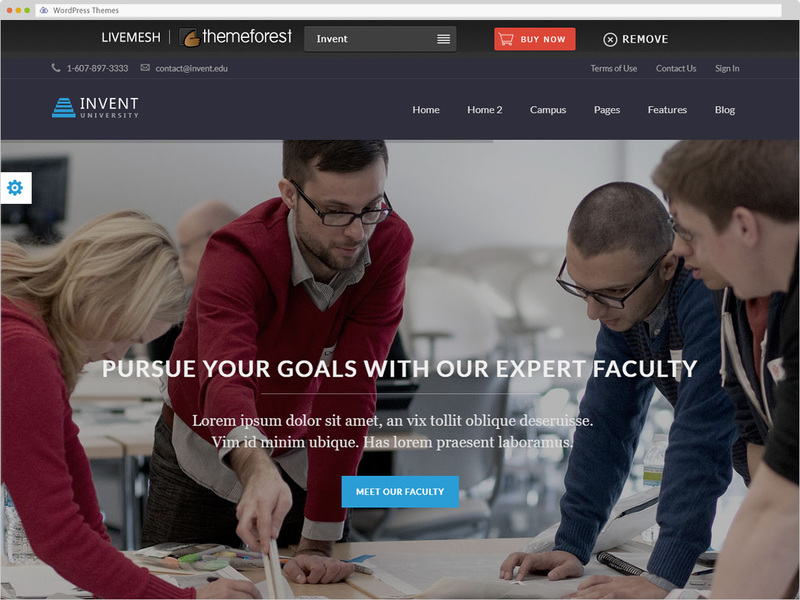 This theme effectively uses WordPress, Sensei, WooCommerce, Event Calendar, Contact Form 7. 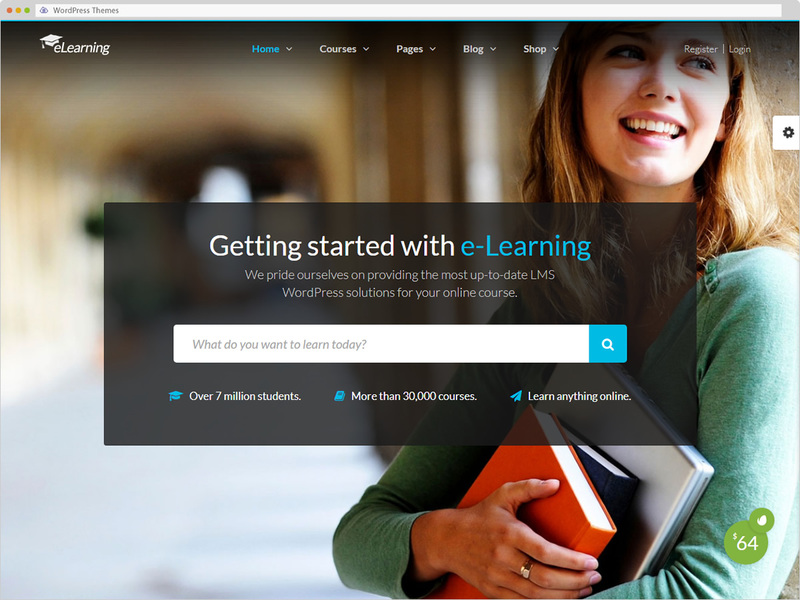 Create your online training website with satisfaction and teach to students around the world. Based on extensive research into the education and learning industry, we have developed a range of first-class features that will make your life easier – saving you time and delivering great results. Revolution Slider is also included so that you can make your site stand out from the crowd, with stunning and dynamic sliders and a range of animations. 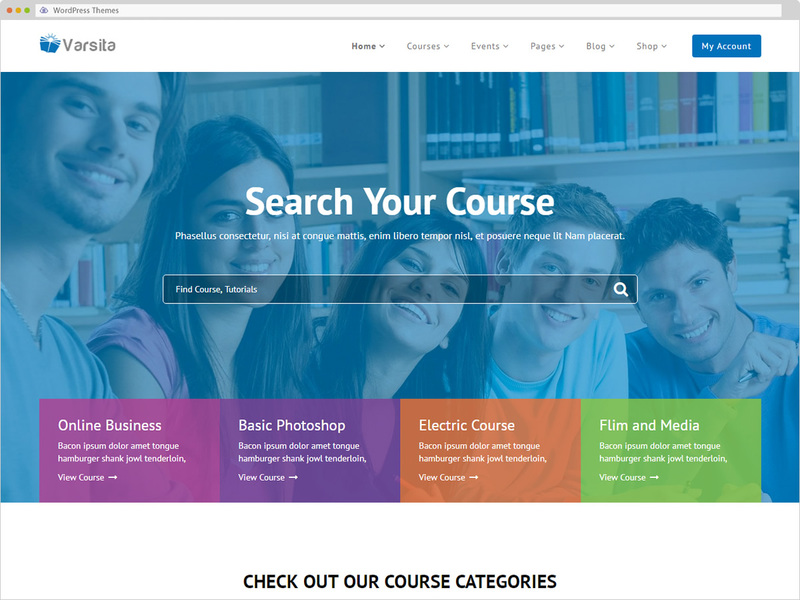 Custom sidebars and widgets give you maximum flexibility as you arrange your content and categorize courses. You can also add profiles for your teaching staff and tutors, with descriptions, photos, certifications and contact details. Students can leave reviews of courses, to spread the word about your learning content, and to help you and your tutors maintain the highest standards. 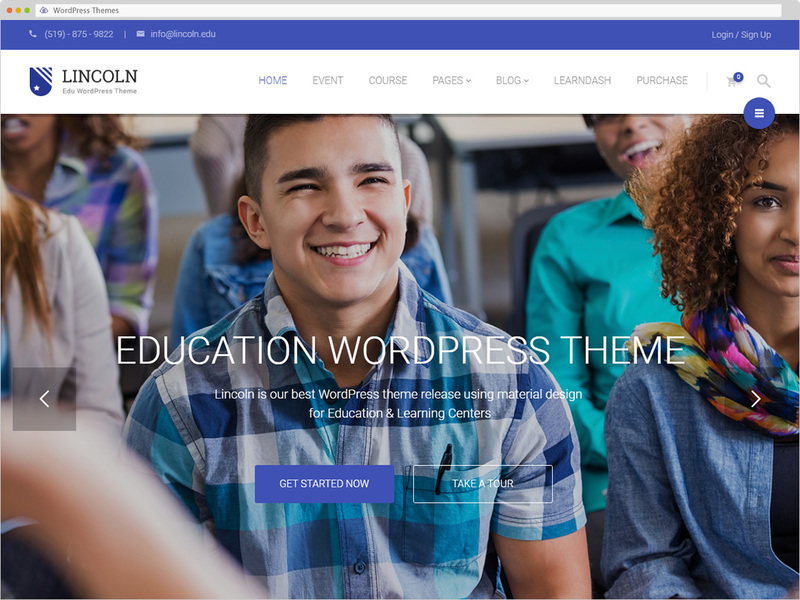 As a complete education WordPress theme, Masterstudy also allows you to create events and publish blog posts, to engage and inspire your learning community. We have integrated MailChimp, too, so that you can easily manage subscriptions and keep your subscribers updated. Set prices and discounts using WooCommerce, and enjoy easy and secure transactions with PayPal. 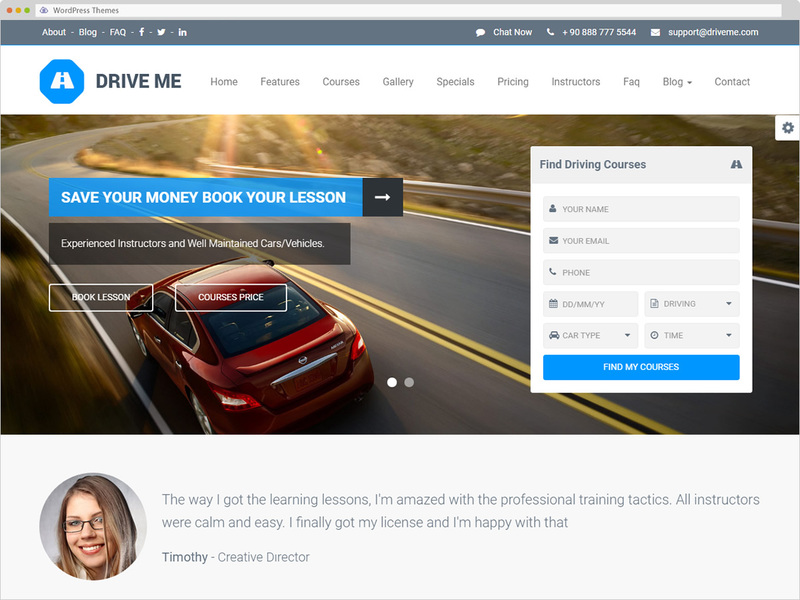 We want you to get the most out of your Masterstudy learning WordPress theme, so we offer personal support and updates, 100% free of charge. 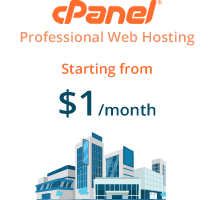 With our one-click demo content install, you can get started right away! 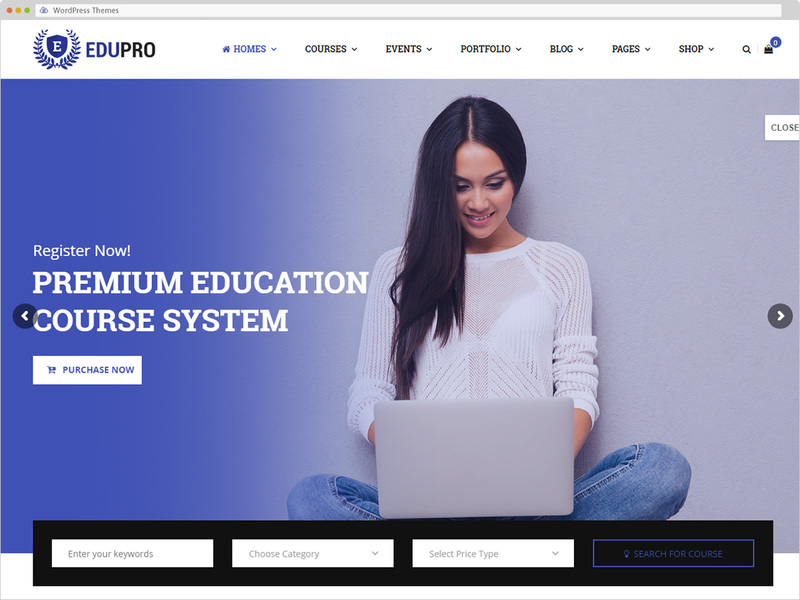 EducationPress is based on the CoursePress Pro Plugin (worth of $228 for Free & Trusted by 50,000+ members) from WPMUDev. This is one of the best plugin that is available in the market that will help you to quickly create beautiful courses using WordPress and nothing else. 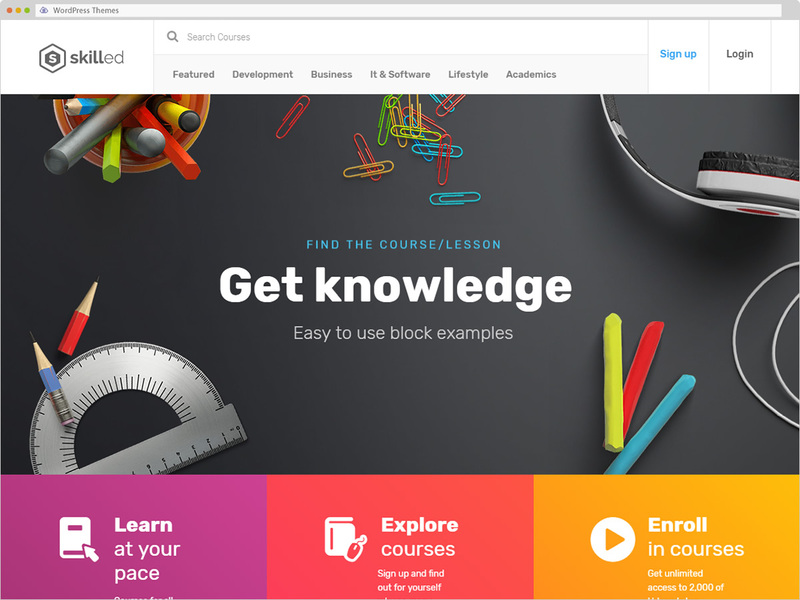 You can create text courses, video-driven courses, create quizzes, share audio, allow users to upload and download and participate in discussions. It allows you to easily create a course, invite students, instructors and even promote them based on their performance. Students too, can track their study progress from their workbook, and upon completion of course, they are awarded certificate with unit wise grade. 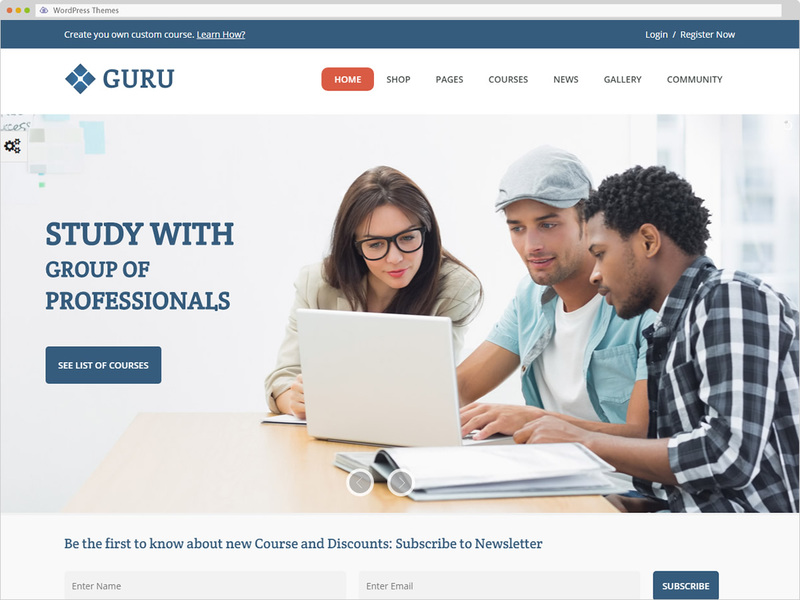 CoursePress Pro have the ability to offer course for free, or sell access to your lessons and materials with simple e-Commerce integration. You can use any of the 13+ payment gateways available with MarketPress to start selling courses quickly. 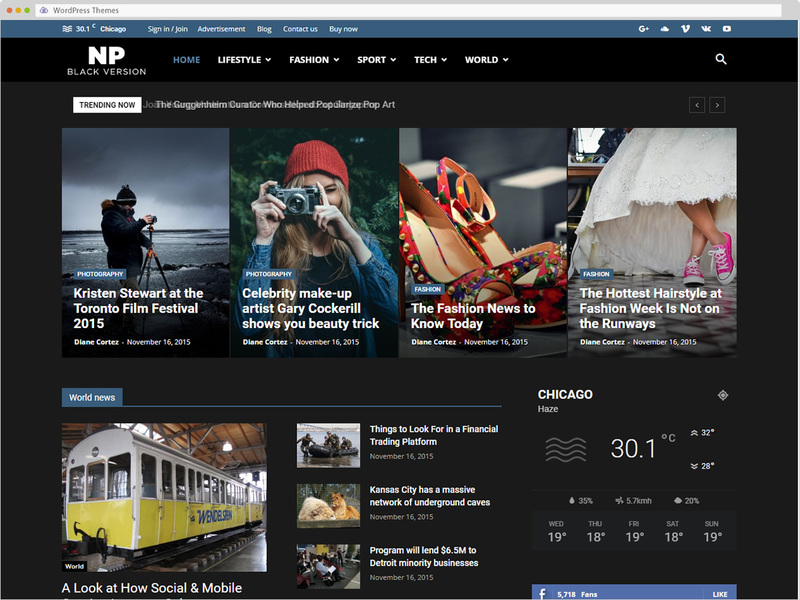 The greatest challenge was to build a theme that is easy to use for non-experienced WordPress users but still powerful enough to fulfill its purpose. I believe that Buntington overcomes all of your expectations! 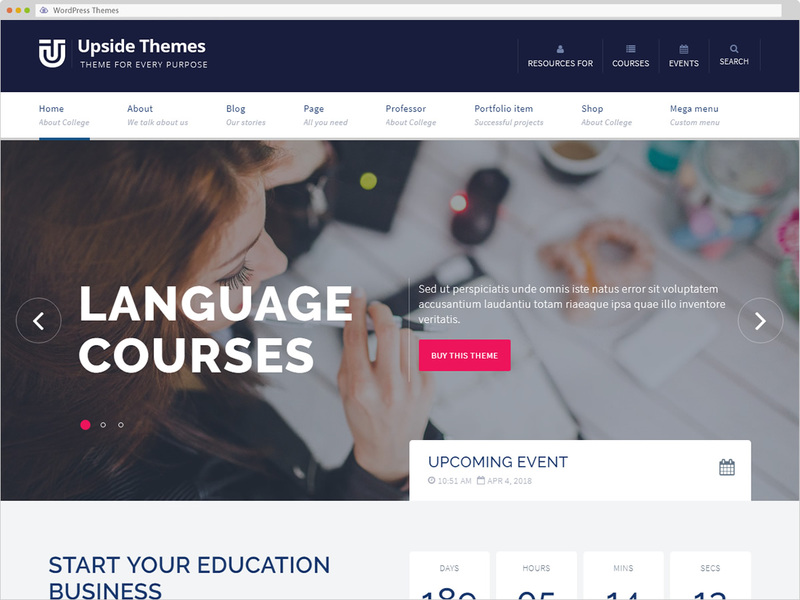 It has a Visual Home Page Builder, Events, Courses (with powerful search included), Sliders builder, Galleries, reusable content library – Content Chunks, a bunch of handy shortcodes, widgets and a damn easy to understand theme Options. If you or your clients long for a powerful management system which is both lightweight and user-friendly Buntington might be a great choice! 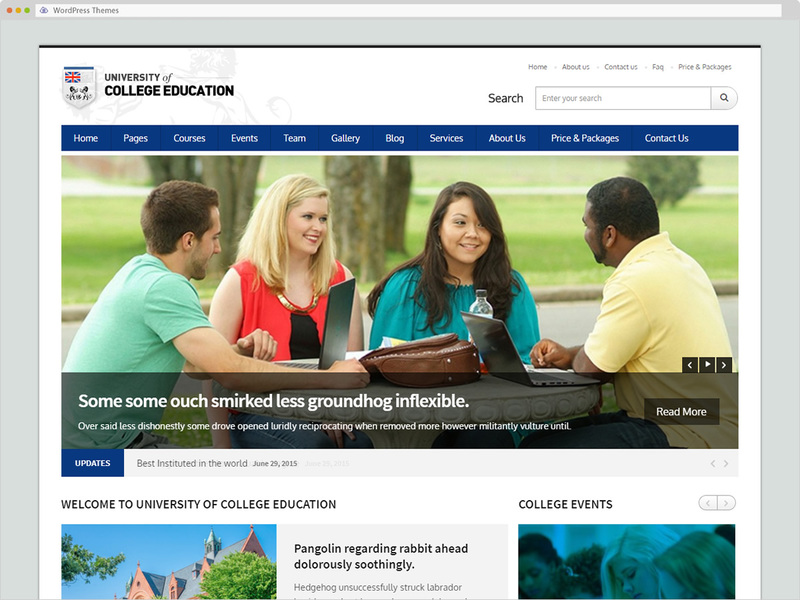 UOCE (University of College Education) is elegant, customizable, easy, and clear WordPress theme. 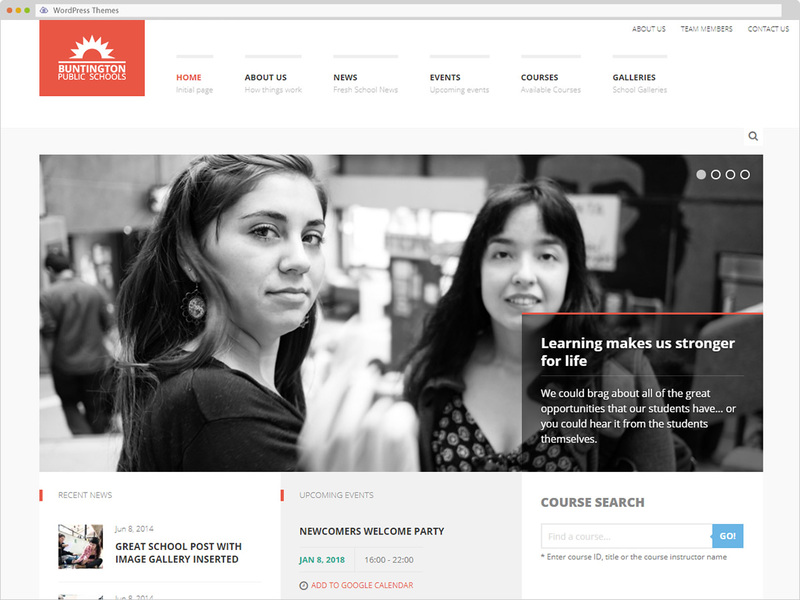 UOCE theme provides stunning features for creating Online Courses, Teams, Events, Galleries and many more for your institute. 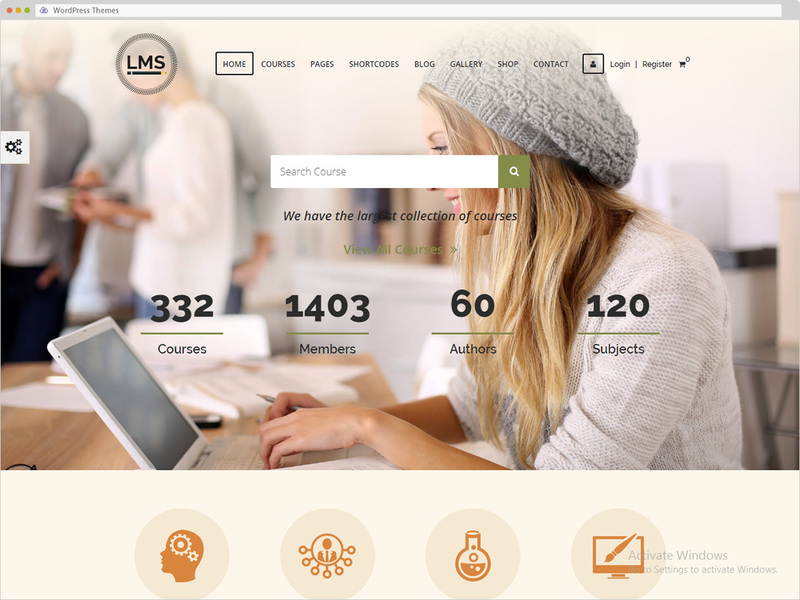 The theme is a complete courses management system where you can create online courses such as, Courses Schedule, Descriptions, Pricing Options and Courses Features. It is the easiest theme to set look & feel as per your choice. 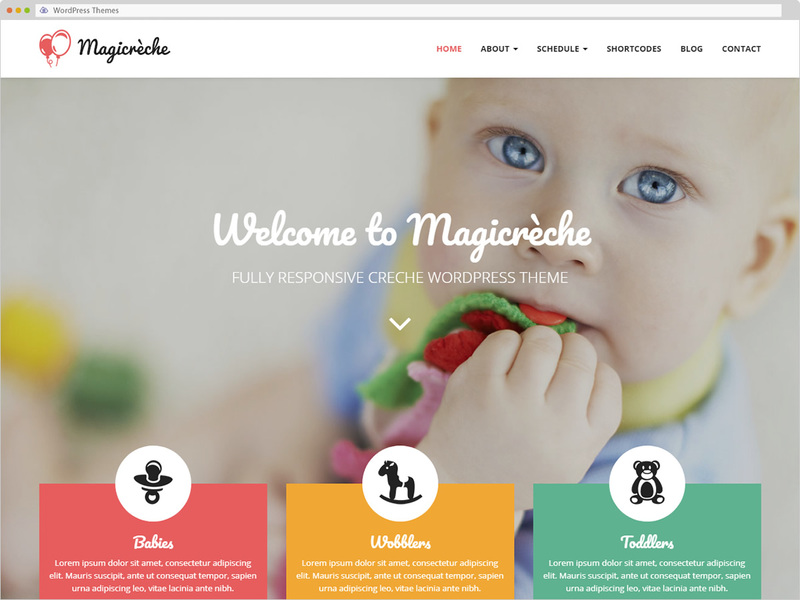 Another astonishing feature Theme is fully compatible with latest SEO techniques. UOCE theme is flexible and have bundle of theme customization options to style your site as per your desire. Also, it can be translated in any language of your choice through WPML plugin. 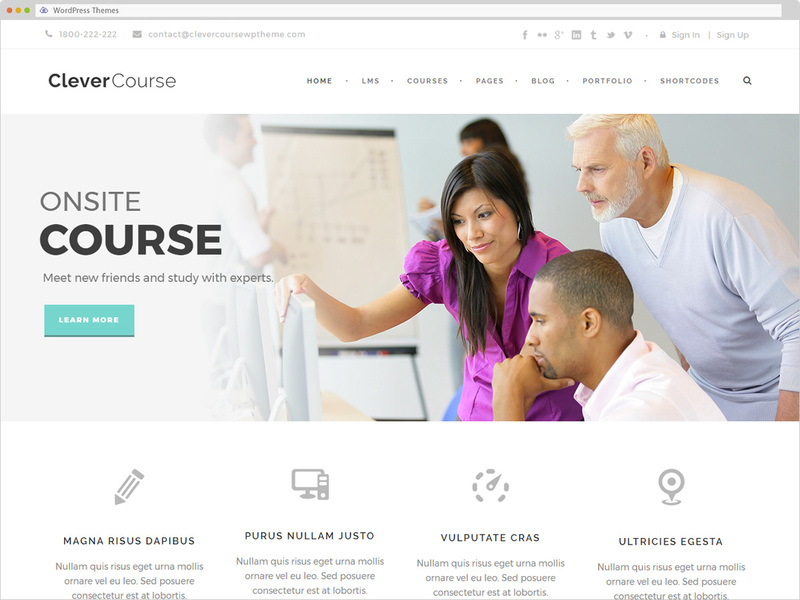 Education Center & Training Course WordPress Theme is created especially for educational establishments like colleges and schools, as well as trainings and courses. 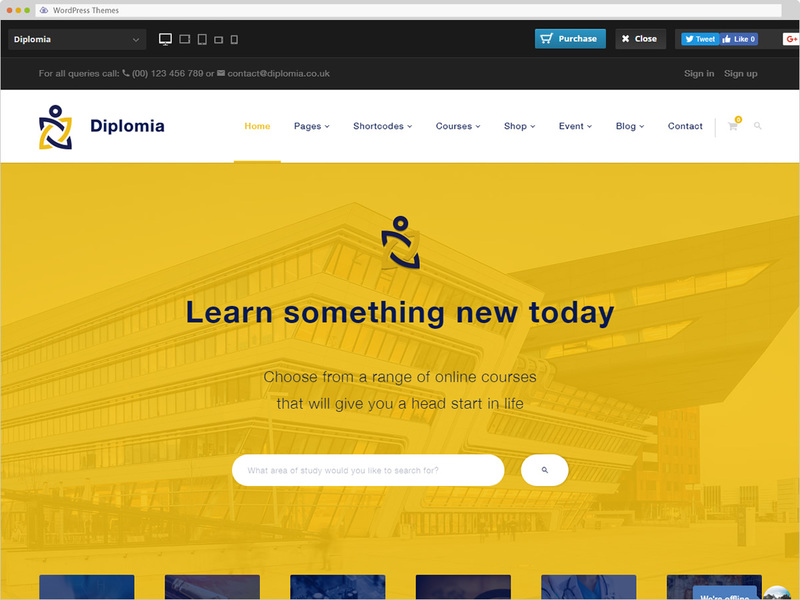 Incredibly colorful design will get your visitors interested, so that they will be applying for your courses with no hesitation. Fully responsive, translation and WooCommerce ready, One Click demo installation, numerous color settings etc. all these features will help you have strong and easy operated online educational business. 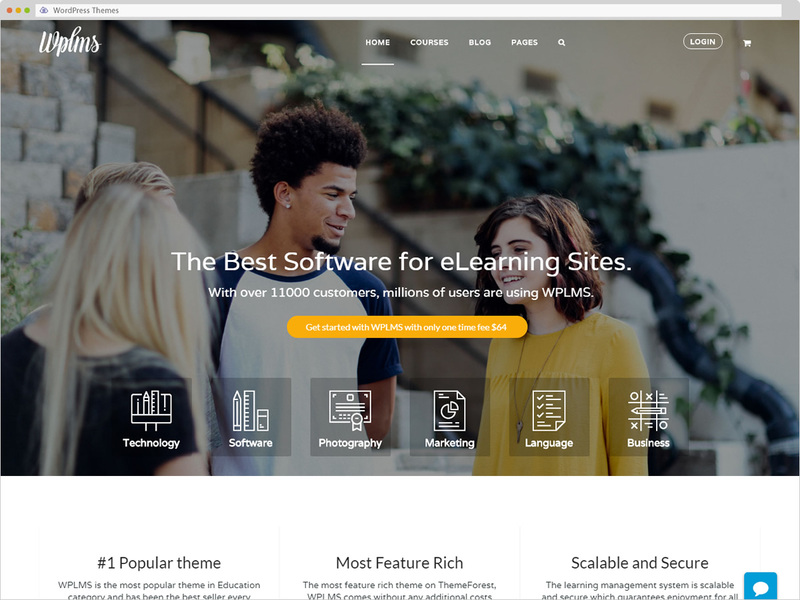 MS is Powerful Learning management system WordPress theme provides awesome features for creating online courses, teacher profile, extended user profiles, lesson management, quiz System, video hosting, ranking / rating system, questions system, attachments, Tracking course progress etc., Build an Education system that uses WordPress, Sensei, Custom posts for courses and quiz, student management, BuddyPress, WooCommerce, Event Calendar, WPML, Mail-chimp. Circle Flip V.3 provides a whole new Experience. It’ll enforce your brand through its consistent blocks and elements. Create your desired website in simple easy steps. 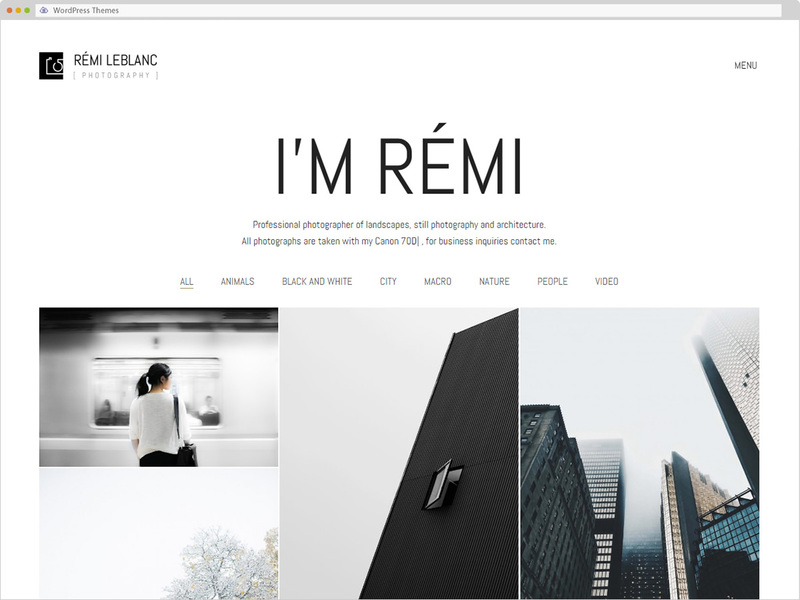 Use our 1-click demo installation to import the site layout and then edit your images and content. 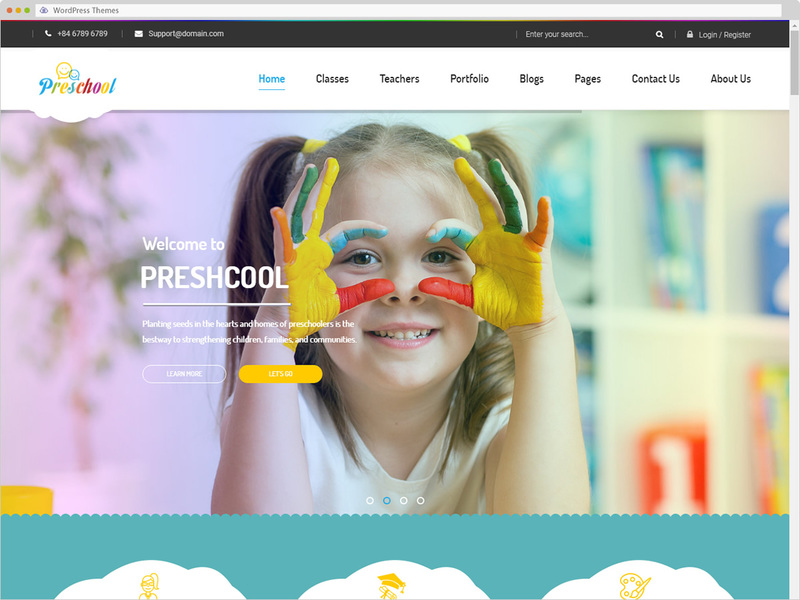 Preschool is a versatile and multipurpose WordPress theme that has been developed with scholastics at heart. 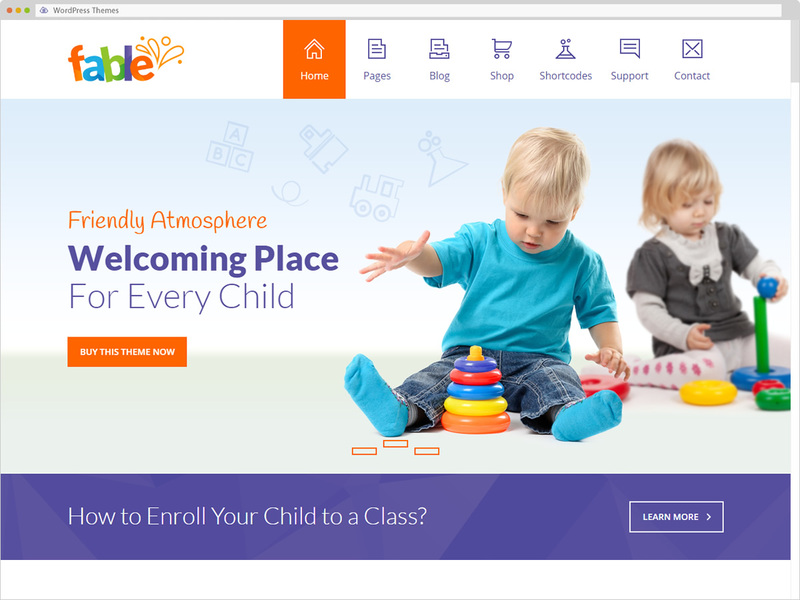 With a playful vibe and a focus on bright and bubbly colour design it is highly suited to early learning websites, including Creche through to Kindergarten, Preschool and Junior through to Primary school learning centres.